I just walked into the house after a morning drive. More on that later. I’m having sort of a freefall of the senses; something in it very reminiscent of the one and only time I jumped out of an airplane. Gravity and direction seem sort of vague, and I feel something that whispers both of euphoria and of panic. I’m current on my meds and my blood pressure is probably just fine. I am short of breath and my heart rate is rapid. I noticed on the drive home how wretched my distance vision has become — it was kind of alarming to notice that I couldn’t read the street signs until I got right up on them. I came across a small journal recently and found several pages outlining the symptoms of a bad fibro relapse. It was interesting to read it while I’m essentially in a remissive phase. There were days when I would get up and run an errand, go back to bed; get up, complete a short assignment, go back to bed. I would sleep up to 14 hours a day and still feel tired. People suggested I was sleeping too much. Hell, I knew that. I also know my body. I know the difference between the malaise that comes from sitting around too much, which exercise will remedy. I also know the bone-crushing exhaustion of fibromyalgia when it surfaces as chronic fatigue. These weather precursors that I experience occur 1 to 2 hours before a front moves in. The more dramatic the symptoms, the quicker and more violent the weather becomes. When I was very ill I would pass out, as if from an attack of narcolepsy. Now the precursors are less possessive, and are similar to the sensation I have when I’m approaching a channeling state. It’s hard to describe, but it’s sort of a feeling of vertigo, a gentle pleasant humming in my head. My sense is that I can almost touch the spirit guide that is present. Sometimes I can channel the guide through writing or typing, but the session is always best when I’m channeling on behalf of someone else. When they are receptive, they contribute their energy and their bandwidth, so to speak, to the communication. And sometimes remarkable things happen. My mission today was to pick blueberries. 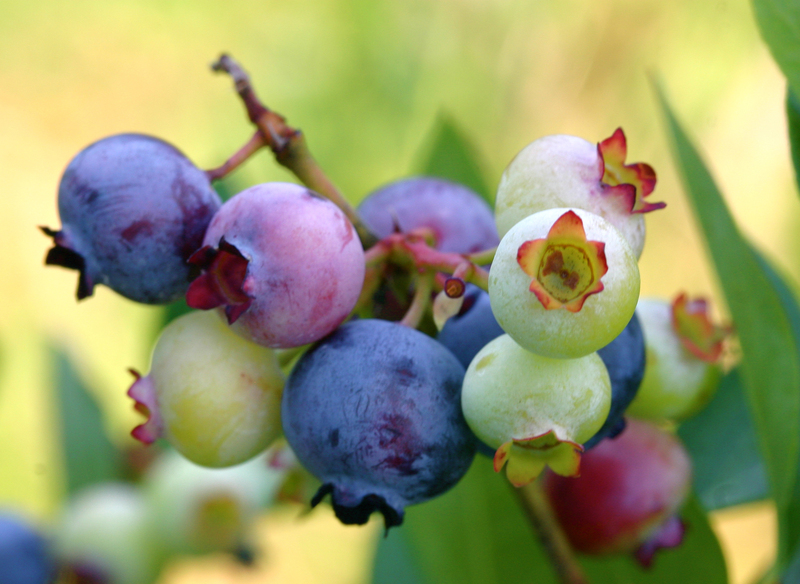 The weather has been lenient of late and I practically missed the strawberry season, and blueberries just started. So I sped off to Nesbit, only to find that there’s no picking on Sunday and Monday. But I had a nice chat with George, stopped at the Dairy Bar for a vanilla shake and made my way home slowly up Highway 51. The sights and sounds of the country nearly almost always sprout hope in my heart. I see little rundown shacks and I think, I could live there. The Capricorn in me points out that I couldn’t live there without Internet access and a lawnmower, but surely that’s manageable. But there was something about seeing the clusters of blueberries on the bushes, thick as grapes, still green, that feels like money in my pocket. They’re just waiting for me, just like the angels. I just need to reach out a little.